The rapid growth of industries has resulted in the generation of high volume of solid and liquid waste. Today, there is a need of Clean and Green technology for the sustainable waste management. 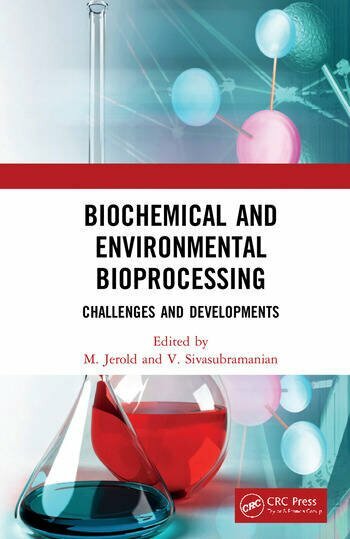 Biochemical and Environmental Bioprocessing: Challenges and Developments explore the State-of-art green technologies to manage the waste and to recover value added products. Microbes play an important role in the bioremediation. Bioprocess engineering an interdisciplinary connects the Science and Technology. The bioconversion and bioremediation is essentially required for the management of various hazardous substances in the environment. This book will give an intensive knowledge on the application of Biochemical and Bioprocess technologies for the eco-friendly management of pollution. This book serves as a fundamental to the students, researchers, academicians and Engineers working in the area of Environmental Bioremediation and in the exploration of various bioproducts from waste. Reviews various biological methods for the treatment of effluents from Industries by using biomass and biopolymers. Highlights the applications of various bioreactors like Anaerobic Sequential Batch Reactor, Continuously stirred anaerobic digester, Up-flow anaerobic sludge blanket reactor, Fluidized and expanded bed reactors. Presents the cultivation of algae in Open Pond, Closed loop System, and Photo-bioreactors for bioenergy production. Discusses the intensified and integrated biorefinery approach by Microwave Irradiation, Pyrolysis, Acoustic cavitation, Hydrodynamic cavitation, Electron beam irradiation, High pressure Autoclave reactor, Steam explosion and photochemical oxidation. Cutting edge research of synthesis of biogenic nanoparticles and Pigments by green route for the health care and environment management. Dr. Jerold Manuel is an Assistant Professor in Department of Biotechnology at National Institute of Technology Warangal, Telangana State, India. Dr. Jerold has immense knowledge in the field of Bioprocessing and Biochemical Engineering. He has Industrial, Teaching and research experience. He works on bunch of research areas like fermentation, Phytoremediation, Biological Wastewater treatment, Biosoprtion, Microbial Fuel Cells, Nanotechnology, Biosurfactant, Biocatayst, Biofuels, and Adsorption of Heavy Metals etc. His research is highly focused on problems related to environmental issues. Especially, on liquid and solid waste management. He has been awarded with research seed money project on Biodiesel Production using Enzymatic Catalyst by National Institute of Technology Warangal. He has identified the macroalgae as feedstock for the production of bioethanol at low cost. He has extensively worked on dye removal using algae for the prospect of textile Industry. He has developed a biocomposite for the removal of dye with maximum Biosorption capacity. Being an interdisciplinary area researcher he is working on hot topics related to Sustainable energy production from Microbial fuel cells, Algal lipid, Biohydrogen from Wastewater and so on. He is also involved in the extraction of various phytochemicals from Algae. In addition to his research, he is involved in teaching for Undergraduate Engineering students. He has handled various subjects related to Biotechnology and Biochemical Engineering Bioreactor Design and Analysis, Downstream Processing, Protein Engineering, Bioprocess Heat Transfer, Biofuel Technology and Engineering, Bioprocess Instrumentation, Environmental Biotechnology, Herbal Biotechnology, Introduction to Life science, Engineering Biology, and Transport Phenomena in Bioprocess System. He has handled various laboratory courses for Bachelor of Technology in Biotechnology Students like Bioprocess and Bioreaction Engineering lab, Transport Phenomena in Bioprocess System lab, Heat and Mass Transfer, Instrumental Methods of Analysis, Fluid Mechanics Lab, Environmental and Pollution Control Lab. He is a highly committed teacher and a researcher works with enthusiastically on cutting edge research areas of Biotechnology. He has been with Dr. D.G.S. Dhinakaran fellowship for his postgraduate education and MHRD Fellowship by Government of India for his Doctoral studies. In addition he has honoured with gold medals for his higher academic credentials by the University at his higher studies. He was the state rank holder during his Pre University level. Jerold has published 24 research and review papers at International and National peer reviewed Journals. In addition, Jerold has authored five Book chapters in reputed book publishers. He is a reviewer for various peer reviewed Journals at international and national level. Velmurugan Sivasubramanian is Professor and Former Head of the Department of Chemical Engineering at National Institute of Technology Calicut (NITC), in Kozhikode, India. He has five years of industrial experience after his graduation. He has been involved in teaching fluidization engineering, environmental engineering, wastewater engineering, energy management, safety and hazards control, principles of chemical engineering, operations management, total quality management for master of technology degree in chemical engineering, petroleum refining and petrochemicals, pharmaceutical technology and environmental science and engineering; chemical reaction engineering, mechanical operations, mass transfer, chemical technology, environmental studies, safety in chemical process industries, energy management, process economics and industrial management, petrochemicals, downstream processing/bioseparations and operations research for a bachelor of technology in chemical engineering and biotechnology; and bioreactor engineering, fluidization engineering, biological wastewater treatment, environmental biotechnology, safety management in process industries, fire engineering and explosion control, and fire modeling and dynamics for the doctoral program since 2001. He received four Awards viz. Dr. Radhakrishnan Gold Medal Award, Jawaharlal Nehru Gold Medal Award, and National Citizenship Gold Medal Award from Global Economic Progress and Research Association (Thiruvannamalai, Tamil Nadu) and the Universal Achievers Gold Medal Award from the Universal Achievers Foundation (Salem, Tamil Nadu) for his outstanding individual achievement in education and contribution to education and national development. He has developed and commercial exploited wastewater treatment using novel bioreactors such as the inverse fluidized bed reactors (IFBRs), photobioreactors (PBRs) and self-forming dynamic membrane reactors for the remediation of dyes, pharmaceuticals and heavy metals. His team has successfully installed a novel magnetic biocomposite for the treatment of dye effluent. Recently, his team developed a 4 m3 floating drum biodigester for the production of biogas, which is used as a fuel in the NITC hostel mess. Sivasubramanian has published several research papers in international and national peer reviewed journals and conferences in the area of environmental and chemical engineering for the treatment of effluents from various industries. His team has earned nine Best Paper Awards at national and international conferences. He is editor for six peerreviewed journals and he also serves as reviewer for more than 50 journals.